SV-1 73, Digital Piano from Korg in the SV-1 series. robdelap's review"Expressive, compact and resourceful." It's a full sized piano, with piano keys and all the bells and whistles in terms of connections, XLR or line outputs, midi in and out, sustain pedal, etc. Korg aimed this product at the professional piano player who needs various timbres at her disposal on a portable solution, and they did so very well. While most of the sound are presets, you can alter various settings with the handsome and responsive knobs on the front, and if 'analog' is your thing, you can 'heat' up things with the built-in AX127 tube. I gotta be honest, most of my experience with this product comes from recording other people playing it, since I'm not a pro piano player. That being said, I've had no trouble asking the performer to adjust the timbre or even experimenting with the vintage sounds. We can almost get where we want quick and easy and once it's setup we can focus on the performance, and that's where, I think, good pianos stand out from the rest of the controller/synth market. As an engineer, it's always a pleasure to mix sounds coming in from this keyboard. Grand Piano, Electric piano, organ, you name it, this one has it all. As I said in the previous paragraph, responsiveness is top notch for performers with piano technique that really use dynamics in their playing, even saturating and distorting pleasantly when really hammered. My favorites are the organ and electric pianos, and since you get all the octaves of a regular piano, you can really spread those chords and create huge sounding pads. I love that you can just plug it in, browse the sounds and hit record in about 5 minutes. I hate that things this good and easy are not cheap. I love that piano players that know what they're doing immediately begin pouring out great sounds out of this device. I hate that I'm not a great piano player. 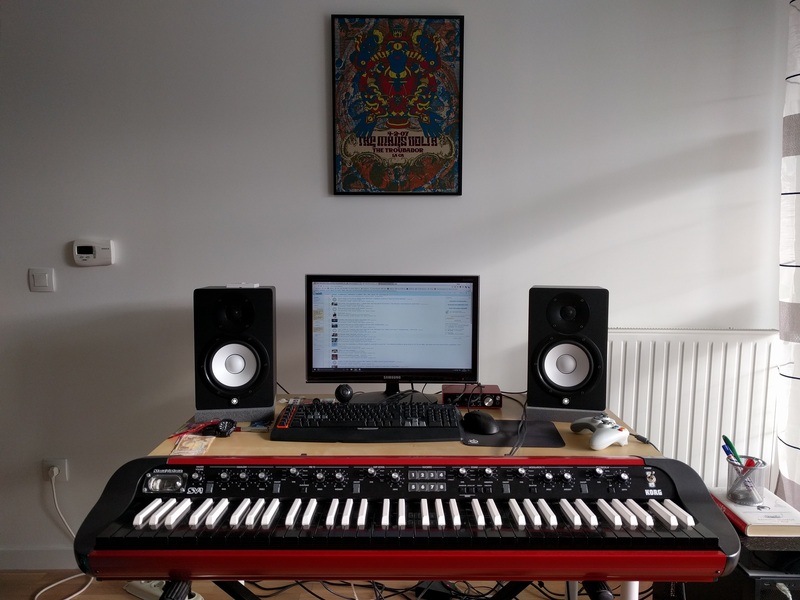 If you're in the look for a piano solution for your studio, definitely give this one a try. Remember that Korg sounds too Korg sometimes and compare it to Nord's options out there, which are definitely strong competitors. The Korg SV-1 is a very good digital electric piano. I have been using it for years, a friend has one at his house. Even though I am not a great pianist its still good for me to get to use it from time to time just to work a little bit on my skills. So for me it is a practice piano but for him and others it’s a piano that they have really polished their skills on. It can be in either 88 or 73 key version, he has the 88 key version and it has a really nice feel too it. Similar to a real grand piano, you really cant even tell that it’s a digital piano buy the feel of the key’s. Of course you can by the sound though because nothing is like a real grand piano except for a real grand piano. 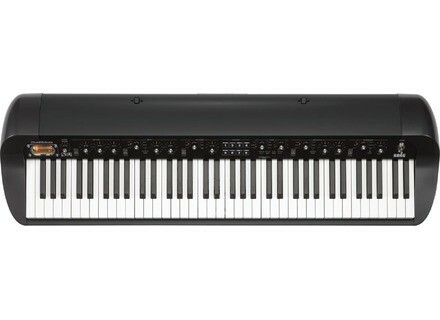 Overall, I would have to say that purchasing this digital piano (Korg SV-1) is really worth the money spent. Its pretty light too just incase you have to transport it from one place to another. It also has mide connection abilities so you can sync it up with your software. Though I have never used that feature so I cant really comment on it. Also, a ¼ jack is available for the pedals that you can purchase. The pedals don’t come with it though, you need to purchase those separately. If you are willing to invest a good amount of money in a vintage style digital piano then the Korg SV-1 will work for you without a question. Not all of the sounds are piano sounds, it also has good Rhodes and organ sounds. Don’t expect to get the synth sounds that you get on workstations though. It just doesn’t have those capabilities. But the electric piano sounds are great, you will be very pleased. 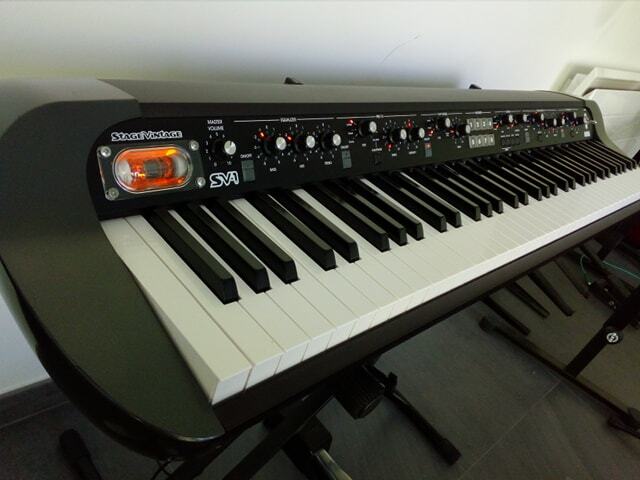 yoTrakkz's review"Vintage is a plus.."
The Korg SV-1 73 is a very high quality compact and portable digital piano that is vintage. So get rid of all that bulky vintage gear and go with the KorgSV-1 73. This board has very high quality sounds for such a little board its very powerful. The sounds on this board are amazing and will surprise everyone from the pro down to the beginner. The Rhodes on the Korg SV – 17 3 are very high quality and they are my favorite sound that the Korg produces. 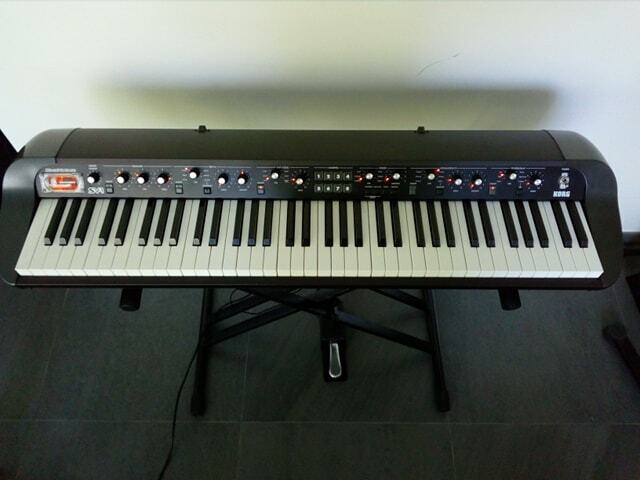 The KorgSV-17 3 is very stable and sturdy, its built to last like most of the other models that Korg makes. Korg is known for bringing high quality gear no matter whether its vintage or not. Korg has always had the upper hand over other companies when it comes to sounds. Korg produces very warm and rich full sounding instruments. If you use this board live, that’s how you will get the most out of it. It has a beautiful live sound and look for vintage gear. This board is top of the line, unfortunately is its priced a little high in my opinion. But all of Korg’s gear is pretty high priced. But they stand behind the product that they create and they don’t do price cuts often. So if you get a good deal on the KorgSV -17 3 then I suggest you get it. This board is stocked with beautiful electric sounds. You can even connect via USB to your computer to get more sounds and keep your board updated. I am very happy with my decision to give the KorgSV-17 3 a try. This board is worth the money if you are willing to invest. So if you need a high quality vintage electric piano make the investment in this one. The Korg Stage Vintage Piano has been given a matte black stage finish.